Our last E-mail was from Nakuru just after visiting the Masai Mara NP and saying goodbye to Wendy and Mal. We stayed at Kembu campsite just out of Nakuru on a farm. The owners, Andrew and Zoe, took us on a tour of the dairy farm and horse stud. The 900-acre farm employs 130 people and they provide housing for over 1800 locals. We bought fresh milk, butter, cheese, eggs, vegetables and Eland game meat. The Eland was very nice and tender marinated in honey and garlic. 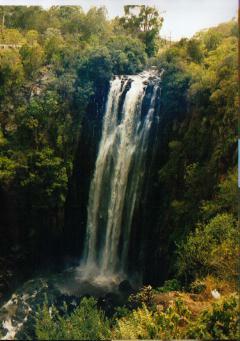 The next day we drove to Thompson Falls and Abedare NP. The weather was quite cold in the highlands despite being on the equator. We camped the night at Naro Moro Lodge which is at the foot of Mount Kenya, the second highest mountain in Africa. Mist and cloud shrouded Mount Kenya however we were able to see the peak and its glaciers when the skies briefly cleared. From this lodge hikers organise the trek to the top of Mount Kenya. From here, we drove around Mount Kenya to Nairobi. The western side of Mount Kenya is broad acre farming and much drier than the densely forested and much wetter eastern side. The first night in Nairobi we camped at the Nairobi Park Services campsite where most of the overland trucks hang out. We were able to talk to a number of overland truck drivers about Eastern Lake Turkana and the road north to Ethiopia. We visited Nairobi NP with great hopes of seeing the elusive Cheetah and Leopard but to no avail. The park was very quiet and dry and we saw the usual giraffe, zebra, gazelle and rhino. We had an early dinner at the well-known Carnivore Restaurant. We tasted different game meat including Ostrich, Zebra, Hartebeest as well as the usual chicken, beef, lamb and pork. We surrendered the white flag when we were unable to eat another mouthful. Of all the game meats we have tried we enjoyed Eland and Ostrich the most. We camped the next night at the Upperhill Campsite near central Nairobi. This is the meeting place for independent overland travellers. Here we met up with friends we have met along the way and other overland travellers coming down from Europe. It was good to be able to glean lots of information from other travellers and exchange travel tips. Our main objective in Nairobi was to apply for our Ethiopian Visa. Our timing could not have been worse. We arrived on Saturday. On Monday morning we found the embassy closed due to Ramadan, the Muslim New Year, and then had to wait for the embassy to open on Thursday. It was not till Friday morning that we were able to pick up our visa which cost a total of US$180. In the mean while Su-lin came down with a high fever and chills. We took her to the doctor and had her checked out for Malaria and Bilharzia. The tests were negative and showed that she simply had the flu. After a doze of antibiotics she was back to mischief in two days. We dropped Dave Young, who had been travelling with us for five weeks, off at the airport to catch his flight back to Perth. We then spent two days catching up with our Kenyan friends, Ross and Caroline, and their Landrover. After a week in Nairobbery, where we escaped unscathed, we set off for Ethiopia. We have been told that Northern Kenya is pretty wild and lawless. In fact just a few days ago ten tourists were robbed at gunpoint in Isiolo and a further eighteen people were killed in Moyale on the border between Kenya and Ethiopia. We decided to head for the desert route to Marsabit via Lake Turkana. After a long days drive from Nairobi via Nakuru, Lake Brogoria and Lake Boringo we arrived at Maralal and camped at Yare Club Campgrounds. Here we caught up with Jerry and Cecile, a South African overland couple we met in Tanzania. A local schoolteacher named John asked if we could give him a lift to Marsabit, via Loyangalani. We really enjoyed his company. He spoke good English and was able to give us a good running commentary on the local Samburu, Turkana and El-Molo tribesman and countryside. The drive to Lake Turkana was slow going but very interesting. We passed through several oases inhabited by different tribes and camped the night in Loyangalani on the edge of Lake Turkana. What a magnificent drive. The surrounding countryside is stunningly desolate, dusty and mountainous yet houses the largest Desert Lake in the world. 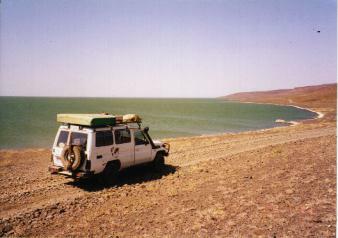 Lake Turkana is also known as the Jade Sea and is fed by the Omo River in Ethiopia. The following day we headed to Marsabit through the Chalbi Desert. Again the drive was slow going. The first 30 km’s was spent negotiating a rough track through volcanic rock which would be better described as a rock plantation. This gave way to a dry, dusty and sandy track to North Horr. 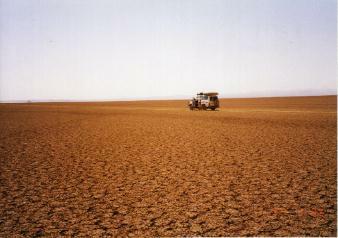 From here we travelled on a dry claypan for about 80km’s before turning off on a gravel road to Marsabit. Another great day’s travel with some of the best desert scenery we have ever seen. Marsabit was another surprise. 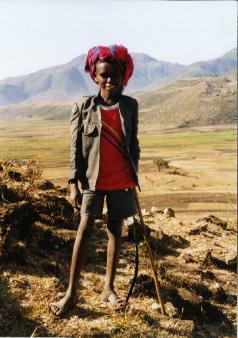 Whilst the countryside was desert, the Marsabit Mountain rose one kilometre above the surrounding countryside. Here, in the Marsabit NP, was a rain forest with dense vegetation and a magnificent crater lake. We camped on the edge of Lake Paradise and watched the Elephants coming down to drink. After a restful day in the cool mountain air we descended to Marsabit town and checked out the convoy to Moyale. Due to banditry along this notorious stretch of road, we were required to have two armed soldiers accompany us. We asked them if there had been recent security problems They told us that it had now been quiet for three days! We set off early in the morning feeling apprehensive, kept our eyes peeled and were very relieved when we arrived safely in Kenyan Moyale mid afternoon. The Kenyan side of Moyale had little to offer so we crossed straight into Ethiopia. Border proceedings were straightforward and cordial as usual. For the first time since leaving Australia the Ethiopian customs officials had a cursory glance in the back of Troopie. Everything was in order and we were quickly on our way and stayed just down the road in Abraham’s Hotel. We had not filled up with fuel since Maralal, some 600 kilometres ago, as the average price of fuel in Kenya was A$0.80. In Kenyan Moyale the price was almost A$1.00 whilst in Ethiopia the price is around A$0.38. 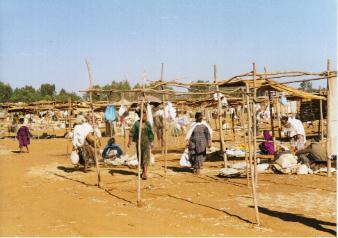 Due to the impending breakout of hostilities between Ethiopia and Eritrea, there was a fuel shortage in Ethiopia. We were very lucky to purchase 40 litres, which was enough to get to the next fuel stop. The following morning we headed north only to find no fuel at any of the stations until Dila. Fortunately, with the fuel we had and the extra forty litres we were able to scrounge in Moyale, we made the distance much to our relief! We camped the night on the shores of Lake Awasa and then headed for Bale Mountain NP. What a spectacular drive! The fertile grain farming lands slowly gave way to rugged forested mountains with craggy peaks. The Bale Mountains NP Sanetti Plateau sits around 12000 feet above sea level. We camped the night at around 7000 feet. From here we headed to Addis Ababa, the capital of Ethiopia, which is the third highest capital city in the world at 7000 feet above sea level. Addis is one of Africa’s largest cities. We were lucky to find our way to the Bel Air Hotel following a maze of streets , none of which were sign posted. Ethiopia does not feel like Africa as the people are a cross between the African and Middle Eastern/ Arabic, in their features. Ethiopia has a strong Islamic influence alongside the Orthodox Christian Church. We are still having a great time and enjoying ourselves immensely. For the first time on our trip we have all had a couple of days of upset tummies which was more of a nuisance than anything else. We are now exploring the options available on how to get from here to the Middle East. The border between Ethiopia and Eritrea is firmly shut due to the border dispute. The local news is talking about an imminent war breaking out between the two countries, however life goes on as usual. If fighting starts it is believed that it will be confined to the border areas which we will not be visiting for obvious reasons. We’ll keep you informed on our progress to the Middle East when we know more. Happy Chinese New Year. We just arrived after a long and tiring drive in Addis. Please, all who are planning to come to Ethiopia via East Turkana Illoret, the border (Haddo) is definitely closed. We were held by the police in this small village for a day and then escorted to Omorate after which we were escorted by the police to Jinka. Police threatening to send us back the same route to Nairobi or Moyale, we in the meantime were not to leave town. After another day discussing with all authorities we called our embassy and they contacted the higher authorities of immigration to allow us to travel to Addis. Asking the police what would happen to the next travellers that were to come the same way, they told us that this would not be possible. Apparently times have changed, before two months travellers were left alone at this border post. Hope this message is not too late for anybody, and good luck on the way. Note: We don't know what the situation is regarding the Lake Turkana crossing from Ethiopia to Kenya. Heading south from Margo National Park/Murule. The track will bring you to a T junction. Turn right and you will go to Omerate, turn left and you will go to Turmi. Take the left turn to Turmi. About 1km on you will need to turn right for the border crossing. Hadu, the village where you will find the border police. The Ethiopian visas cost US$60 each in Kenya. Note that theoretically you should provide vehicle details when you apply for your visa. They will then give you a signed vehicle form to hand to customs on arrival. Customs will ask for this form on arrival. However, the customs checkpoint were still letting vehicles through that did not have this form so whilst its better to have this form it does not appear to be mandatory. Of all the countries we travelled through, Kenya was without question the most dangerous country. We heard many instances where people were robbed or mugged. You must take a military/police convoy to travel between Isiolo (just north of Mount Kenya) and Moyale (Ethiopia/Kenya border). The road is rough and very corrugated. We actually travelled from Nakuru, Loruk, Marala, along Lake Turkana to Loiyangalani and then through North Horr to Marsabit. This allowed us to miss some of the trouble spots but was still required to travel via convoy from Marsabit to Moyale which cost us US$30. The countryside around Lake Turkana is spectacular. It is possible to illegally cross into Ethiopia by heading north from Loiyangalani to Illeret and Banya Fort into Ethiopia south of Turmi. The Moyale immigration/customs told me that the police station at Illeret can handle immigration and customs formalities and so they should be able to stamp you and your vehicle's carnet out of Kenya although one report suggests that this is not true. When you arrive in Addis Ababa you will need to go to immigration to explain how you entered Ethiopia. Friends we know who did this said that the immigration officials were not happy and it took them a couple of days to sort out the paper work. The advantage is that it is safer, shorter and more scenic. If this route appeals to you then it might also be worth asking the Ethiopian embassy in Nairobi or Kampala. They may be able to provide you a letter to hand over to immigration in Addis Ababa. If they do not issue you with a letter then remember that this is not a legal crossing point so you need to weigh up the pros and cons. If you’re travelling south from Ethiopia to Kenya then the crossing is actually easier. The immigration officials in Moyale said that the police in Illeret can stamp you into the country. I know people who did this route but forgot to ask if the police were able to stamp their passports or whether this had to be done in Nairobi. In any case they said they had no problems. Whilst this is a very scenic route, it is also a very remote area and you need to carry enough fuel to go between Turmi in Ethiopia and Maralal in Kenya, a distance of 800km but fuel for 1000km would be required to allow a margin of safety.